Flooding affected drivers and householders across south and west Wales. Aerial footage courtesy of RAF Valley. Heavy rain has led to hundreds of flood calls across south and west Wales, with the rail and road network badly hit. 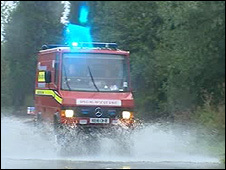 South Wales Fire Service dealt with more than 500 calls to flooding incidents during Friday. Rail passengers were advised not to travel, while about 100 people across south Wales have been forced to leave their homes. As the rain spread. 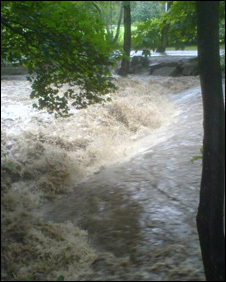 properties were flooded in parts of mid Wales and at least one school had to be evacuated. There are now 34 Environment Agency flood warnings across Wales, two of them severe warnings for the rivers Rhymney and Taff. The Met Office also has a severe weather warning in place with more localised flooding expected. BBC weather forecaster Liam Dutton said almost 1.5 inches (38.1mm) of rain had fallen in parts of mid Wales between midnight and 1500 BST, with Lake Vyrnwy in Powys recording rainfall of 33.8mm and Sennybridge 32.8mm. Thirty properties have been evacuated in Rhydyfelin near Pontypridd because of the risk of flooding from the River Taff. Residents on the A4054 Cardiff Road/Castle Street were moved to temporary accommodation at Hawthorn Leisure Centre. Rhondda Cynon Taf Council also said 12 houses in Nantyfedw, Abercynon have been evacuated and the residents have been moved to the local day centre. South Wales Fire Service said 40 flats near New Tredegar in Caerphilly county were asked to leave their homes because of the River Rhymney. People living in Birchgrove flats in Tirphil were asked to leave their homes along with 30 more residents living in private houses nearby. Bridgend Council declared a major incident and evacuated staff from its civic offices opposite the Ogmore river. 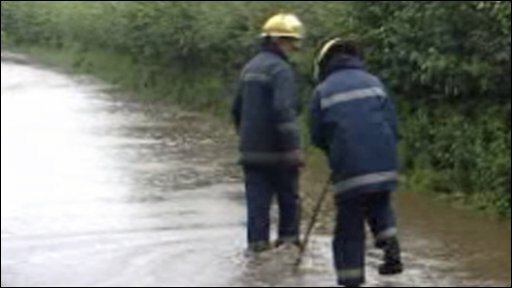 South Wales Fire Service said it received more than 350 flood-related calls in a six hour period on Friday, many of them for people stranded in flood water. It was particularly busy in the Abercynon, Treforest and the Glyncoch area of Pontypridd, Church Village and Llantrisant and the Aberbargoed to Abercarn area. Six terraced houses in a street in Ynysboeth, near Abercynon, have been flooded with 4ft (1.2m) of water, after a culvert and a manhole both burst due to pressure of water this morning. Deanne Palmer was in a house with her nephew when a torrent of water passed the window, and she had to carry the boy on her shoulders to a neighbour's house for safety. Fire crews in Pembrokeshire and Carmarthenshire were also called to incidents. Arriva Trains Wales services between Cardiff and Treherbert were stopped following a landslip in the Trehafod area, with no estimate for when they will resume. There are no services to Treherbert and Aberdare and all trains are terminating at Pontypridd. The company says all services are severely disrupted and there are no services between Cardiff and Bridgend, although services to Merthyr Tydfil were running again by mid afternoon. Ebbw valley line services are not running between Cross Keys and Ebbw Vale Parkway and services on the Rhymney Valley are severely disrupted. An 8ft (2.4m) wall collapsed in Park Street, Pontypridd, while at Dowlais, Merthyr, a woman was rescued from a car under a bridge. A number of pubs have reported water in cellars. A number of main roads between Pontypridd and the Rhondda and Cynon valleys, as well as the A465 Heads of the Valleys road and A470 between Pontypridd and Abercynon were also flood-affected. Mid and West Wales Fire and Rescue Service said Burry Port, Saundersfoot and the Tenby areas were particularly badly affected. They were also called to incidents in Ammanford, Neath, Carmarthen, Narberth, Cardigan and New Quay. In Powys, emergency rest centres were set up at leisure centres in Brecon and Newtown for people unable to make it back home. Earlier 155 children were evacuated from Cradoc junior school at Brecon and taken to the leisure centre for shelter. Fire crews have been pumping out the Boar's Head public house in in Brecon and have also been called to flooded homes there and at Penybont near Llandrindod Wells where the River Ithon has flooded. The A40 was closed in both directions between Brecon and Sennybridge. Substantial surface water was reported on roads in Pembrokeshire after a heavy downpour, which forced Broad Haven Primary School to close. Ferry firm Stena Line has cancelled its 0855 BST and 1500 BST sailings from Holyhead, Anglesey. The gay and lesbian festival Cardiff Pride 2008, due to be held on Saturday, has had to pull out of Coopers Field, which is waterlogged. Organisers and council officials agreed to a scaled-down version in the city's Churchill Way in the form of a street party starting at 1200 BST. However, the Jazz in the Park festival in Pontypool, due to start on Friday evening, was cancelled. 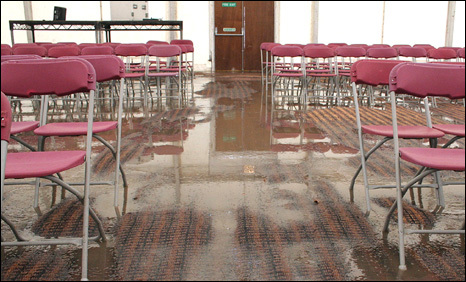 Two of the marquees were reportedly under 4in (10 cm) of water. Torfaen Council staff were working to dismantle the marquees before the weather became any worse. Around 50 acts, including veteran pianist Stan Tracey, were due to appear. Meanwhile, next Thursday's Chepstow races meeting and the Usk Show, due to be held on 13 September, were both cancelled in advance due to ground conditions. The delays and disruption come after a motorist became trapped in his 4x4 in the River Rhiw near Welshpool on Thursday. He was rescued by an RAF helicopter. 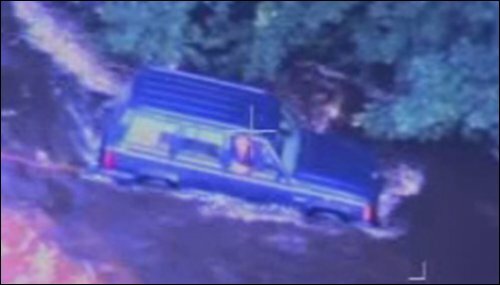 The 60-year-old had been trying to cross a ford when he became stranded. The stormy start to September follows the wettest August in Wales since 1992. Environment Agency Wales said rivers are "unseasonably high" following the recent rainfall and emergency services are on alert as Wales could feel the brunt of the first of the autumn storms. John Mosedale, flood risk manager for Environment Agency Wales, said: "We have had over four inches (of rain) in the last 48 hours which is why the rivers have been so high. "We did now heavy rain was coming, but the difficulty is know when and where it was going to fall."